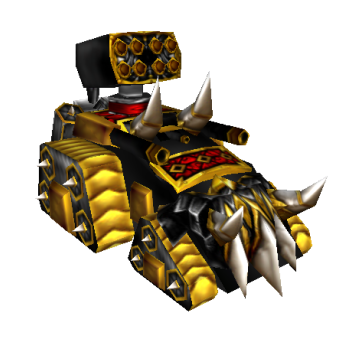 The Darkness Tank is a midgame tank, that specializes in confusing and weakening his enemies, before killing them off. He is able to completely stop any means of healing, burn mana or totally shut off enemy vision over the map, as long as they are within his ultimate. With this the Darkness Tank is able to create unique situations, where he make his enemies completely oblivious to other actions on the map and thus maybe help his teammates in capturing a control point or two. He also has a unique tank cannon at his disposal, which is able to deal high amounts of damage in a short amount of time. Launches a slow moving orb towards a target area. The orb deals 750 damage, which increases the more damage it takes. When the orb gets destroyed, it also stuns for 2s. Places a buff on target enemy tanks, which won’t be able to regenerate any HP for the duration of the spell. They’ll additionally lose 2% of their max HP per second. Whenever an enemy tank within 1000 range uses mana, Energy Leak will burn additional mana shorty after that and deal ten times the burned mana in damage. Creates an area of total darkness in which enemy tanks lose shared vision of their allies and they are also slowed. Activates a rapid firing tank cannon, which fires every 0.2s for 2 seconds in 900 range.